Base of Operations: Mega-City One; formerly stayed in Rowdy Yates Block. Powers/Abilities: Dredd has bionic eyes to replace ones ripped out by an enemy several years back, but while they give him excellent vision, they are not superhuman. He is as physically fit as any human can get, and exceptionally skilled in all forms of combat. As a Judge he has available to him an incredible array of equipment and specialist back-up, should his regular weaponry of Lawgiver gun and Lawmaster bike prove insufficient. History: (summary) In the toughest city in the world, Mega-City One, you've got to be something pretty special yourself to maintain the law. 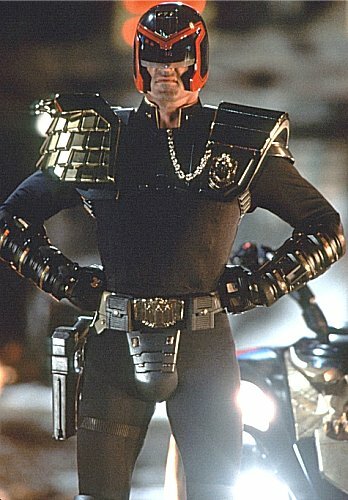 And to still be considered the world's top law enforcer when you've been doing the job on the mean streets for forty-six years, when you yourself are pushing sixty, means you can only be one man: Judge Dredd. At the end of the 21st century, law enforcement took a harsh turn in order to deal with a harsh new world, the legacy of a nuclear war and severe overcrowding among the survivors. The police and juries were replaced with Judges, able to dispense instant and permanent justice. To get the caliber of law-enforcers needed to handle this kind of responsibility, Judges were picked at age five and normally trained for fifteen years before being released onto the streets. This long and grueling training process ensured only the toughest and most dedicated made it through. Mega-City One, the first and largest of the enormous population centres left after the war, started making clones of some of their top judges in a bid to ensure sufficient manpower. 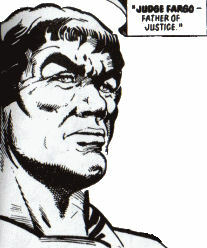 Judge Dredd was a clone of Chief Judge Fargo, the first leader of the Judges. He was born in 2066, and grew up at an accelerated rate. He graduated from the Academy in 2079, and has protected his people and his city ever since...often from themselves. Dredd has become a symbol of the law, and deliberately maintains this image of being a faceless representative of the system, virtually never being seen without his uniform helmet on. He's hard, but he's fair. But most of all, and as anybody in the "Big Meg" can tell you...He is the LAW!! (Judge Whitey, Prog #2) Dredd is with Chief Judge Goodman, who is congratulating him for bringing down the crime rates in the sectors he has been patrolling, when the corpse of Judge Alvin arrives back from patrol, strapped to his bike. Finding a defiant note from the killer, Whitey, pinned to the dead man's chest, Goodman decides to call in an air attack to obliterate the gang's hideout. Dredd suggest instead that he go in alone, to show the people that the Judges don't need to call in the heavy artillery just because things have gotten a little tough. Heading over to the perp's base in the Empire State Building, Dredd sets his bike on automatic and sneaks in the back while the gang are distracted. He guns down Whitey's partners, then captures the Judge killer alive. He sentences Whitey to life imprisonment on Devil's Island, then returns to headquarters to hang Alvin's badge alongside those of other Judges who died in the line of duty. Goodman mentions he thinks that is sometimes how thinks they will all die, and Dredd replies "Maybe, but in my book, that's the only way to go...in defence of the Law." (The New You, Prog #3) Dredd is on patrol when details about "Scarface" Joe Levine, a wanted murderer, are sent through to his bike computer. Unknown to Dredd, Levine has altered his features in the New You Face Parlour. Driving by the lawman, the cocky criminal wished him a good day, only for Dredd to set after him in hot pursuit. 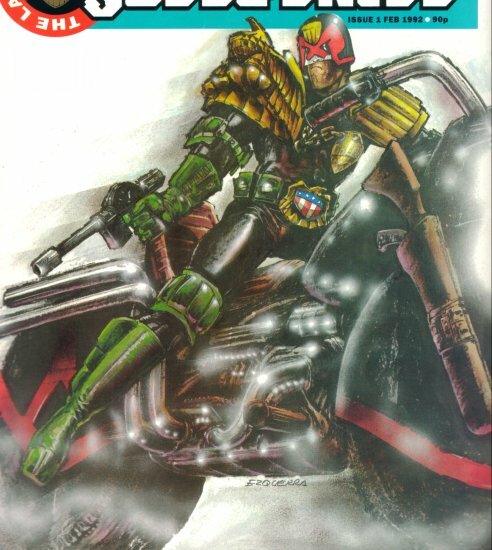 Catching up to the criminal's speeding vehicle, Dredd jumps from his bike onto the car, shoots him through the windscreen, then leaps back to the Lawmaster as Levine crashes. Returning to the scene, Dredd is asked by the injured perp how he was recognised, and the Judge reveals it was his voice-print which gave him away. (The Brotherhood of Darkness, Prog #4) A crazed mutant sect, the Brotherhood of Darkness, invade the city and kidnap a number of citizens before the Judges, Dredd among them, drives them back out into the atomic wilderness. Dredd is ordered to rescue the Mayor's son, who is among those who have been taken. He disguises himself by putting on a robe taken from one of the sect and accompanies them as they leave the city. Upon reaching the Brotherhood's camp, Dredd realises the mayor's son is but one of many hostages, and decides he cannot abandon the others to their fate. He waits until most of the mutants are asleep, then eliminates the guards. However as he loads the captured citizens aboard a truck, the Brotherhood realise what is happening and block their escape. Dredd sets off a flare, and as he surmised, the Brotherhood are unable to handle the bright light. The convoy of escapees makes its way back to Mega-City One, with Dredd at its head. Comments: Created by John Wagner, Alan Grant and Carlos Ezquerra. Among the Judges he has worked most closely with over the years (often prior to their demise in the line of duty) are Anderson of PSI division, Giant (Senior, who was killed by Sov agent Orlok the Assassin), Galen DeMarco (who left the force after falling in love with Dredd - Judges are not allowed a life outside the law), Hershey (now Chief Judge) and Dekker (who died during Judgement Day fighting zombies). Normally however, he works alone. Dredd went through the Academy of Law together with his brother Rico. He was nicknamed "Old Stoney Face" by his fellow Cadets because he stuck so rigidly by the rules and the law, and is still called this even today. Early in his career Dredd had to arrest Rico and was later forced to kill him when he returned to Mega City One to get his revenge for having served twenty years on Titan. The character of Dredd was partially inspired by Dirty Harry Callahan, with some of his look being taken from the poster for Death Race 2000 (and hence Sylvester Stallone, who would later play the character in the movie version). John Wagner (who was born in America, but moved to Scotland when he was thirteen) came up with the concept of the idea, Carlos Ezquerra designed his look, and Pat Mills came up with the name (which he was originally going to use for a different character). So I'm bending my own rules a bit to include Dredd as a British character. Speaking of the name, it's likely that Pat Mills was inspired (consciously or otherwise) by the 1960's Reggae song "Judge Dread", by Prince Buster, which talks of a judge so stern he'd sentence criminals to 400 years, and if anyone challenged his sentences, he'd sentence them too. As touched on in the text above, in 1995 a big screen Judge Dredd movie was made, starring Sylvester Stallone in the lead role. 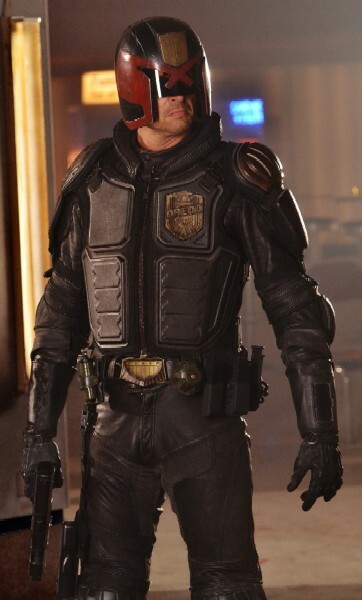 There are a number of variations in the character (Dredd removes his helmet, he questions the Law in favour of Justice by the end of the movie, he lets Hershey kiss him without arresting her, and he doesn't know he and Rico are clones), the differences aren't sufficient to warrant giving him a separate entry. As for the costume, apart from the lycra trousers and corresponding hilarious codpiece, it's actually pretty accurate (see right). What was wrong with outfitting him with leather trousers, I don't know. A new Dredd movie was released in 2012, starring Karl Urban as Judge Dredd. It's a much better movie in almost every way - the only place the original might be considered to beat it is the visual depiction of Mega-City One and the Cursed Earth, the visually excellent depiction of the Angel Gang and the ABC robot's (Hammerstein's) visuals, both largely the results of having a much smaller budget.